Located in Caribou, Maine, the Nylander Museum of Natural History was dedicated in 1939 by Maine Governor Lewis Barrows. The museum was built as a WPA project. The museum’s construction was jointly funded by federal, state, and municipal governments. The museum was originally designed to house the collections of Olof O. Nylander, a self-taught naturalist from Oremella, Sweden. Born in 1864, Mr. Nylander became interested in natural history as a youth. His spare time was spent collecting fossils and mineral specimens. As a teenager he apprenticed as a house painter. He lived for two years in Stockholm, working as a painter and spent his free time visiting the many museums in Stockholm. In 1883 he left Sweden and emigrated to the United States. For the first few years, he worked in Massachusetts, Florida and Rhode Island as a painter. In his free time he cultivated a keen interest in the natural sciences. His skills as a geologist were in demand. Olof was engaged by the U.S. Geological Survey as a field collector. He was also contracted by the Canadian Government and numerous colleges and universities to perform field research or act as a guide. Besides his geology and paleontology skills, Olof Nylander was very knowledgeable of the flora and fauna; in particular, the mollusca of Aroostook County, Maine and the adjoining areas in Canada. Some mollusk shell specimens he collected are as small as the head of a pin, and can be viewed by the public in our museum. Mr. Nylander published numerous scientific papers and booklets, most at his own expense. He was frequently addressed as professor or doctor. Recognizing his years of community service and significant contributions to scientific exploration, the University of Maine at Orono awarded Mr. Nylander an Honorary Master of Science degree in 1938. 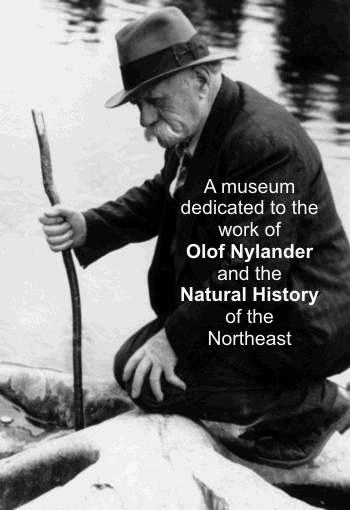 The following year in 1939, the Nylander Museum was officially dedicated and became a department of city government in Caribou, Maine; a unique and distinguishing compliment to the city’s taxpayers, who continue to support the museum and its preservation of northern Maine natural history. Nylander was hired as the museum’s first curator-director, in agreement that his collections would be donated to the city upon his death, which occurred suddenly in 1943. Throughout the years, various museums, including the Smithsonian and the National Museum of Canada, wanted to acquire all or part of the original Nylander collection. The Nylander collection has remained intact; part of which is permanently on display year-round at the Nylander Museum. Today the Nylander Museum houses the original Nylander collection and additional specimens and exhibits that have been donated or are on loan to the museum. Fossils of Northeastern North America – added 11/18/2009 4:34:00 PMMaine State Fossils.